← Vurma: Being healthy as never been so easy!! I didn’t really know what I was doing when I started this blog a few months ago. I certainly didn’t know how long it would last. Let’s say that I have a tendency to get bored quickly with stuff. That may explain why Sweden is the 5th country in which I have lived in the last 15 years. I like changes. But so far I am enjoying the blog ride. 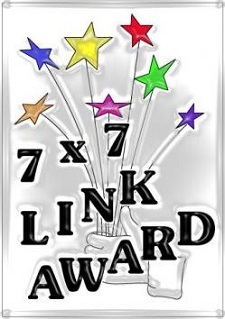 I get to meet a bunch of nice people, like Currie Rose who recently awarded me the 7X7 Link Award. To be honest, I was pretty excited when I got my first blog award. Then I calmed down a bit when I realized how many awards there were out there 😉 Now I am just grateful when somebody takes the time to give me an award and I am more than happy to play along. To me, it is a nice way to share a bit more with fellow bloggers who take the time to stop by my site. List 7 things about yourself. Nominate 7 other bloggers for this award. Most Controversial: Santa doesn’t do poor countries. But UNICEF does. 1- I have been trying to grow a beard for the last 3 weeks and I still look like a teenager (without the acne). 2- I am such a big fan of Swedish band First Aid Kit that I feel like a groupie. 3- I don’t do drugs but I love beer and scotch. 4- I have now accepted that I will never run a half marathon under 2 hours. 5- I got haircuts in six different countries so far. 7- I eat so slowly that it drives most of my friends crazy. And as always, for more great blogs, please visit my page “Blogs I follow“. Thank you! Lately I have a tendency to go back to the places I like the most. I need to get back on “discovery” mode. OMG, A tribute to ME!!!!??!! Thanks so much, this really and truly made my day. 🙂 I do so love being just the right amount of craziness. It’s good. I’m definitely never bored with myself…. Yes, I know I should quit… I guess I just need some sort of incentive besides good health, extending my life and not smelling like an ashtray…. I wish I had that slow eating problem. I usually gobble down my food so fast that I am up for thirds before my friends are done with their first plates. 🙂 That probably means that you really enjoy your food though, right? I hear you on enjoying food. I love it so much that I tell people I would marry it if I could. Hey!! Merci mon ami!! I like the way this one works – makes you think about the different ways people could interpret your posts. Neat! Hope you had a great weekend friend! Is it springyer there yet? It feels like flippin early March right now… possibility of SNOW over night. blech. ps. I hope you don’t get bored of blogging. That would be sad for me, and the internet writ large. Bet you didn’t think I could pull out “writ large” in a comments section – think again! Ah! I will admit that this was a bit unexpected but this is not the first – nor the last – time that you surprise me!